The news that the number of people killed or seriously injured on Kent's roads has rise by 13% is hardly a surprise given the failure of KCC to do anything with transport other than build more roads. What is particularly shocking is KCC's attempt to blame one particular pile up for the rise. 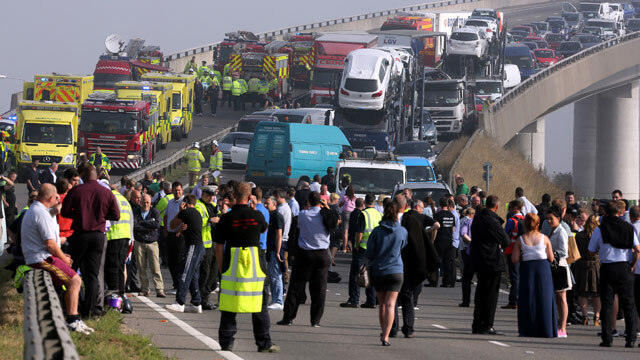 The number of KSI has risen from 524 to 594, a rise of 70 whereas there were just 8 people were seriously injured in the Sheppey Bridge pile up. So what about the other 62 people? Cllr Brazier also seems to claim that this rise is a one off. It is not, the number rose from 2011 to 2012 too. Let's not forget the number of people who die each year due to the traffic pollution. 745 people dies in 2010 in Kent (plus another 125 in Medway). These people are the forgotten causalities. KCC are failing the people of Kent. KCC's love affair with the car must end now. It needs to start seriously tackle road safety, make 20mph in residential areas the norm, it must reduce the number of cars by investing in cycling, walking and public transport. And most of all it must end its deadly love affair.